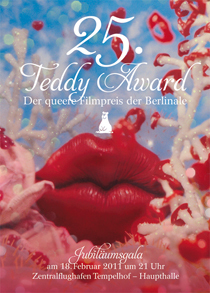 The TEDDY AWRAD, celebrates under the programme of the 61th Berlin International Film Festival, which runs from the 10th till the 20th of February 2011, his 25-year-old jubilee. On the festive gala event on the 18th of February, 2011 followed by an After Party, will award the queer film Award's, in the categories Best Feature, Film, Best Documentary/Essay Film and Best Short Film, as well as the Special Teddy for artistic life's work given to an outstanding personality to the 25th time within the scope of the Berlinale. Once again UNAIDS, the Joint United Nations Program, is the institutional partner of the TEDDY AWARD. 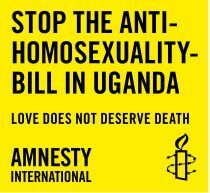 Amnesty International is a new institutional partner who stands substantially very close to the goals of the TEDDY AWARD. TEDDY supports the PositHIVe Screenings of the Berliner Aids-Hilfe under patronage of Wieland Speck from Dez. 01, 2010 - Dez. 05 2010 at Hackesche Höfe Kino and Kant Kino. In the context of their 25. anniversary and on the occasion of World AIDS Day the Berlin AIDS-Hilfe present films with the topic HIV - from the beginnings to the present.